For additional infomation click on 'Comments' below. During the night of 5 / 6 June 1944 the 'Red Devils' came out of the darkness, coming to land in the Normandy countryside. This area would become the eastern flank of the Allied Normandy bridgehead during the summer of 1944 - the 'pivot' around which the final breakout would revolve. These first 'Red Devils' to fall out of the sky were the men of British 6th Airborne Division who were detailed to liberate the eastern flank of the bridgehead and hold it against any German counter-attack for as long as necessary and come what may. The first dwelling in French 'liberated' by the 'Red Devils' of the 6th Airborne Division was the Gondrée café, Benouville. This café is next to the Caen canal and adjacent to the bridge over the canal that would subsequently become known as 'Pegasus Bridge'. The name comes from the winged horse Pegasus, emblem of the Allied Airborne Forces. In June 1944 the Gondrée café was owned by Georges and Thérèse Gondrée, who lived there with their three young daughters, Georgette, Arlette and Françoise. 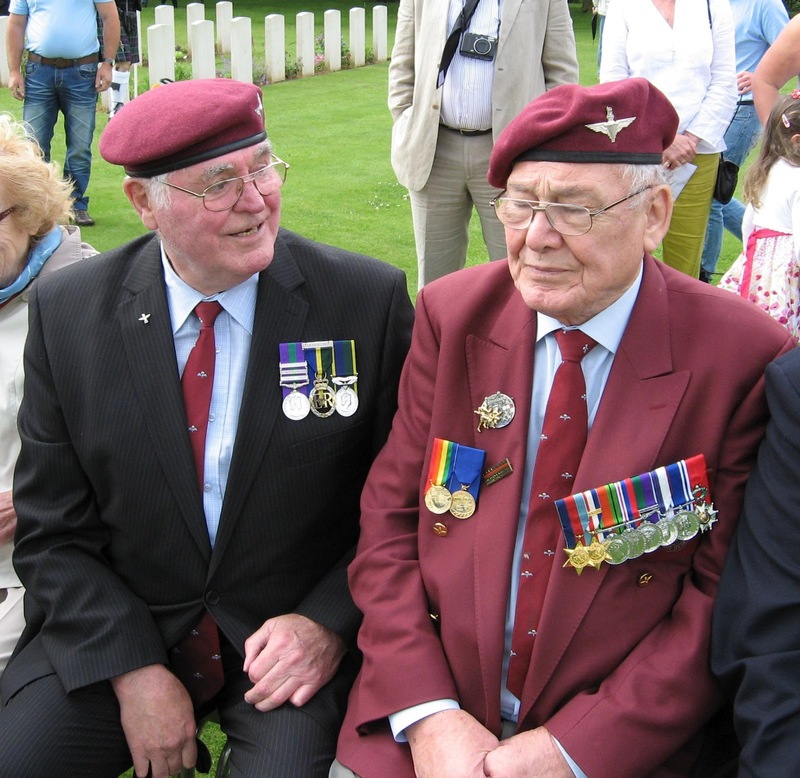 Since the war, in early June each year many veterans, relatives and friends of the Allied Airborne Forces have returned on pilgrimage to visit the land they helped liberate and where many of their closest friends lost their lives. 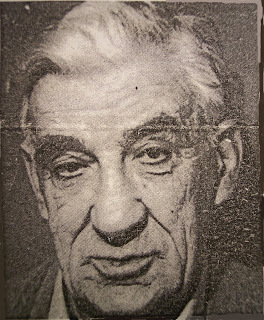 Monsieur Georges Gondrée passed away on 5 April 1969. Madame Thérèse Gondrée, who became known as the 'Mother of the 6th Airborne Division', passed away on 2 July 1984 shortly after the 40th anniversary of the Liberation. Their daughter, Mme. Arlette Gondrée-Pritchett, and her family still run the Gondrée café. They are also among the local residents from the area who take part in the annual Liberation commemorations. Mme. Arlette is seen in one of the photographs above with Major Ray Devlin, T.D., a Suez veteran (Photograph No. 1). Among the other 'Red Devils' who dropped out of the dark of the night into Normandy were men of the 3rd Parachute Brigade, commanded by Brigadier James Hill, D.S.O., M.C. One of its battalions, the 9th Parachute Battalion, had as its first task to take out the German coastal defence battery at Merville before dawn on D-Day. Next, they had to capture Le Plein, hand over to Lord Lovatt's commandos when they arrived from the Sword Landing Beach in the afternoon, then take and hold the Château Saint-Côme overlooking the Orne river, Caen canal and the Pegasus and Orne river bridges. 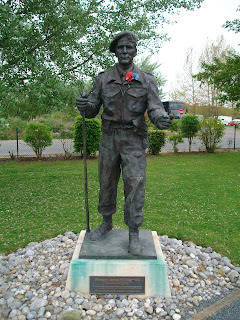 A statue of Brigadier James Hill is now found in the grounds of the "Memorial Pegasus" Museum (Photograph No. 2 above). Among the men of 9th Parachute Regiment who helped 9th Para take its objectives were Pte. Gordon Newton (seen with Major Ray Devlin in Photograph No. 3 above) and Cpl. James McGuinness, M.M. (Photograph No. 4). Major Devlin was formerly a neighbour of Cpl. McGuinness and is President of the Cumbria Branch of the Parachute Regiment Association. Vous remercie de l’intérêt que vous portez à son Musée de Pegasus Bridge qui doit sa notoriété aux acteurs du 6 Juin qui l’ont crée avec Françoise Gondrée , une équipe de bénévoles pendant tant d’années et qui est toujours en activité . Aujourd’hui, notre Musée de Pegasus Bridge dit ‘Mémorial’- il s’agit bien du même Musée - dont le siège est au Musée sur la commune de Ranville - que le Comité du Débarquement nous a usurpé avec la connivence des institutions locales depuis plus de 10 ans. Il faut maintenant dénoncer ce scandale ! Si le Musée de Pegasus Bridge, a toutes ses pièces, le comité du débarquement n’a strictement rien pour se justifier, d’où son emploi de coups bas et autres……. Notre combat depuis plus de 10 ans avance cependant. Les procédures sont toujours en cours car le Musée de Pegasus Bridge ne cédera pas aux marchands du souvenir. La démocratie doit être respectée et le patrimoine rendu . en créant un lien à votre site ou blog, en signant la pétition, en diffusant partout notre vérité. As the previous comment by 'Musée de Pegasus Bridge' (the Pegasus Bridge Museum) has been written in French, I have given an English translation below. For Anglophones who may not be aware of the history of the museums and the WW2 collections in the Airborne Landing area of Normandy, it should perhaps be pointed out that there has been an ongoing legal process for some years between various interested parties. It would take up a lot of space to explain this in any detail. However, the disputes have been well documented by the the local, national and international media. 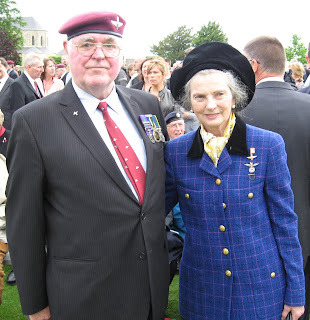 Thank you for your interest in the Pegasus Bridge Museum, which owes its origins to the players of 6 June who created it and have continued to run it for so many years, together with Françoise Gondrée and a team of volunteers. 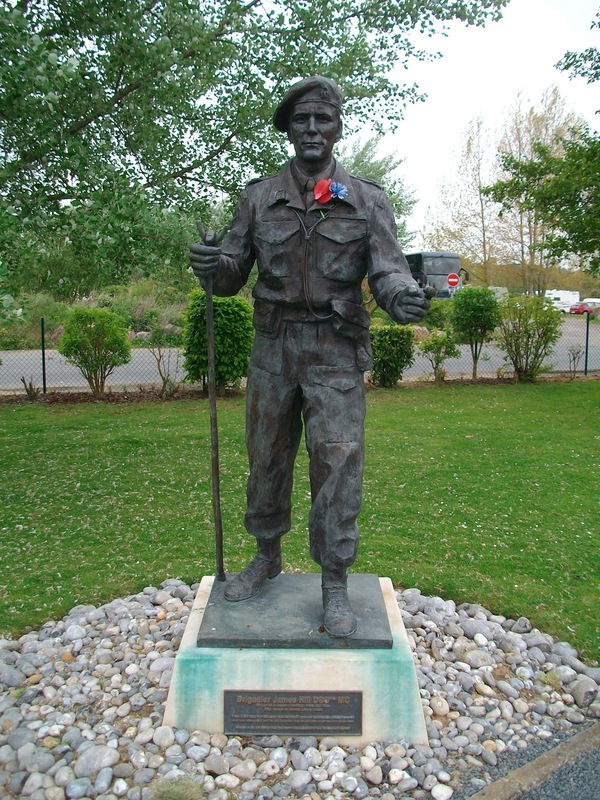 Today, our Pegasus Bridge Museum, also called the ' Mémorial' - it is the same Museum - with its Museum headquarters in the community of Ranville - continues to be usurped by the Normandy Landings Committee along with the connivance of some local institutions for more than 10 years. We must now denounce this scandal! Democracy must be respected and heritage retained. or by creating a link to your website or blog, by signing our petition and by passing on the truth of the matter. Mlle. Françoise Gondrée is the youngest daughter of Georges and Thérèse Gondrée, owners of the Pegasus Bridge café at the time of the Liberation. It is as President of the 'Musée de Pegasus Bridge' that Françoise Gondrée has posted the above comment. I would to find out more about my uncle (my mother's brother) George Caddock (London) 6th Airborne Division "Red Devils"
""However, the disputes have been well documented by the the local, national and international media."" Aspeg, Musée de Pegasus Bridge.